1 To make the ragù, heat a large frying pan and add 1 tbsp olive oil. Cook the mince in batches until browned, then transfer to a colander set over a bowl to remove any excess fat. Add the onion, celery and garlic to the pan, and sauté until softened. Return the mince to the pan, add the tomato purée and stir well. Next add the stock, thyme and tomatoes then season, cover and simmer for 1½ hours, stirring occasionally until the beef is tender and the ragù has reduced. 2 Preheat the oven to 220°C, gas mark 7. To make the courgette layer, stir together 2 tbsp olive oil, and the garlic and thyme leaves. Arrange the courgette slices on a large baking sheet, making sure they sit in a single layer. Brush with the oil and roast for 20 minutes (no need to turn) until tender and lightly browned. 3 For the white sauce, melt the olive spread in a saucepan and then add the gluten free flour, stir well and cook over the heat for 1-2 minutes. Next, gradually add the warmed almond drink whilst continuously whisking until thickened. Add the Dijon mustard and nutmeg. Stir well and set to one side. 4 Cook the lasagne sheets in a large pan of boiling water for 5-6 minutes, then drain well. 5 Turn the oven down to 200°C, gas mark 6. 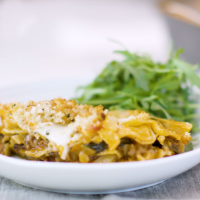 To assemble the lasagne, spread one third of the ragù in a 20x30cm ovenproof dish, and top with a quarter of the white sauce followed by one third of the roasted courgette and lasagne sheets. Repeat this process, finishing with the white sauce. Sit the dish on a baking sheet and bake for 15 minutes. 6 Meanwhile, tear the bread into pieces and place in a small food processor with the garlic and thyme. Whizz until the mixture forms fine crumbs then add the olive oil and whizz again. Scatter over the breadcrumb mixture and return to the oven for 20 minutes, until the lasagne is tender and the topping is crisp and golden.